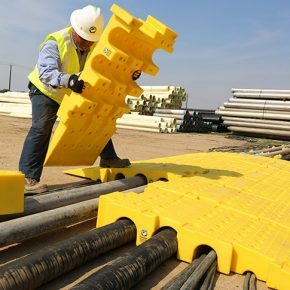 Rain for Rent’s unique WORKSAFE® RampLox® are modular and durable temporary pipe and hose ramps. 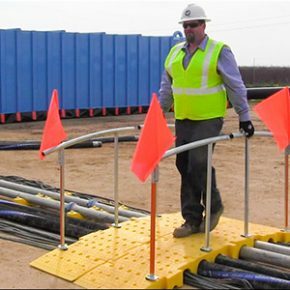 By interlocking RampLox units to achieve your desired width, your hose, pipe, and conduit will be protected and vehicle or pedestrian traffic will continue unimpeded. Two smaller tunnels for wire/cable. Low profile, making them easy to drive or walk over with a minimum vehicle clearance of 7”. Interlocking design allows them to tolerate minor to moderate ground surface variation. Vehicle crossings can be created using at least five pairs of RampLox to achieve a legal road width of 120 in (10 ft). Infinite length possibility. 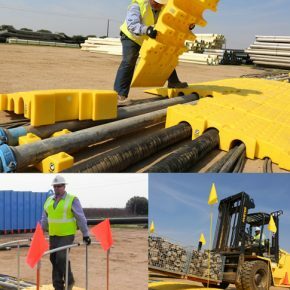 The lightweight design and hand cutouts make RampLox easy for one person to install and disassemble, eliminating the need for heavy machinery. 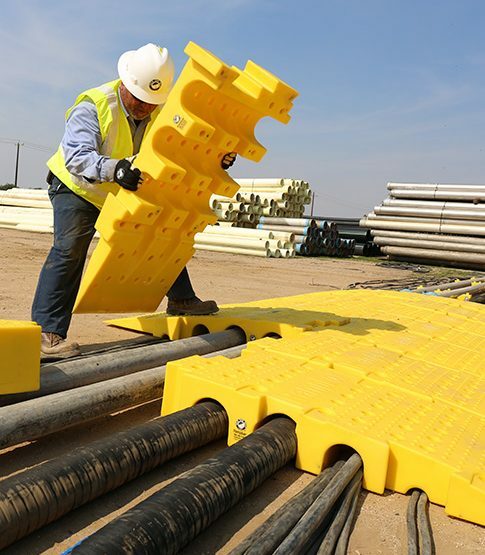 Designed with a textured grip surface for stability and traction on the jobsite. Each RampLox segment features two 0.5” anchor holes with room for fender washers for added security. 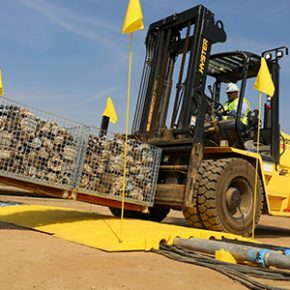 It is recommended that anchors be at least 3” to 12” in length and ¼” to ½” in diameter. Weight per RampLox: 63 lbs.